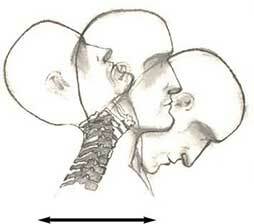 This diagram illustrates a whiplash injury. Note how the neck is overextended and then hyper flexed. Especially the extension injury damages the facet joints of the neck. The disrupted joint surfaces become inflamed and can lead to arthritic changes. The ligaments, muscles, nerves and other soft tissue can also be damaged by the tremendous strain placed on them during a whiplash injury. The intervertebral discs can also be damaged and lead to neck pain and stiffness. If the disc tears, it may press against a nerve root or even the spinal cord leading to nerve irritation or damage. This can lead to arm pain, pins and needles and even weakness of muscles. The spine consists of a series of vertebrae that are stacked on top of one another from the neck to the pelvis. These vertebrae are connected and kept in the correct position by the discs that are between the vertebrae and also the facet joints that interlock with one another. There are also supporting ligaments and tendons. The discs between the two adjacent vertebrae are composed of a central, soft, jelly-like substance called the nucleus pulposus and an outer, tougher fibrous part called the annulus fibrosus. See the section Anatomy of the Spine. This injury is caused when the neck is forcefully jerked backward and then forward. When the neck is forcefully flexed forward, the movement is stopped by the chin hitting the chest. There is, however, no barrier to stop the neck from going backward and the main function of headrests in cars is to limit this movement. When the neck is suddenly and forcefully jerked, for instance during a motor vehicle accident where the car is hit from behind, there is tremendous strain on the tissues of the neck. The muscles, tendons, vertebrae, discs and joints can be damaged. The muscles that tear can trap nerves in the scar tissue that forms during the healing process of the torn muscles and this can cause chronic headaches and neck pain. However, the main cause for neck pain is the damage that the joints suffer. The damage to these joints causes ongoing mechanical neck pain and referred pain. Sometimes symptoms appear over a period of time after the accident took place. Damage to the facet joints between the second and third cervical vertebrae can cause referred headaches. Damage to the joints between the fifth and sixth vertebrae are usually responsible for neck pain, arm pain and pain between the shoulder blades. Cervical facet joint pain is typically a unilateral (one-sided), dull and aching neck pain with referral into the back of the neck and between the shoulder blades. Shortly after the accident, neck pain may be minimal with an onset of symptoms during the subsequent 12 – 72 hours. If the damage also caused disruption of the intervertebral disc, then there could be compression of a nerve root and radicular pain (nerve root pain) that may extend down the whole length of the arm. Some patients experience dizziness which may result from injury to facet joints that are supplied with balance receptors (proprioceptors) which can cause confused feedback to the midbrain and brainstem, where balance is controlled. There is a grading system that is used to define the seriousness of the injury. Grade 0 – No neck pain complaints, no physical signs. Grade 1 – Neck pain complaints, stiffness and/or tenderness, but no other physical signs. Grade 2 – Neck pain complaints and musculoskeletal signs (decreased range of motion and point tenderness). Grade 3 – Neck pain complaints and neurologic signs (weakness, sensory and reflex changes). Grade 4 – Neck pain complaints with fracture and/or dislocation. A clinical examination by your specialist or therapist will allow for a reasonable suspicion, but a CT scan and radio isotope scan (see the section Tests and Scans) will help make the diagnosis. The CT scan will give information about the anatomy of the joints and the radio isotope scan will reveal any inflammation in the joints. Tests can, however, only give an indication and should be interpreted along with the clinical picture. The available treatment includes anti-inflammatory medication, analgesics, physiotherapy and other manual treatments such as chiropractic treatment, pressure point therapy, massage therapy, traction and other therapies. Rhizotomies can be very successful in the management of whiplash injuries (see the section Cervical Radiofrequency Rhizotomy). The only real complication is the fact that this condition is difficult to treat and treatment is not always successful. There have been reports that overzealous chiropractic treatment of the neck can have complications, but modern chiropractic techniques are much better tolerated. In cases where the symptoms settle with conservative measures, the symptoms may reappear at some stage. This is a condition with ongoing morbidity and treatment has to be ongoing. In some cases symptoms are resistant to all treatment and this can be a challenging situation to manage.